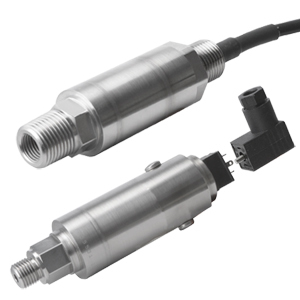 OMEGA’s PX51 Series consists of high-accuracy, low-cost pressure transmitters. Their sealed, all stainless steel construction makes them suitable for the harshest environments. They are available in gage, absolute, or sealed gauge models. Ten feet of PVC insulated shielded cable is standard, or a twist-lock style connector is also available. A wide selection of amplified voltage and current outputs makes the PX51 a truly versatile family of industrial transmitters. Nota: All models come complete with 5-point NIST traceable calibration. To order sealed gage pressure models, replace “G” in model number with “SG” (no extra charge). To order Standard configurations including Potentiometers, no suffix required. For “No Potentiometers”, add “NP” suffix.